Today, I’m happy to announce the official release of Logicly version 1.9. As you may recall, generating a truth tables was added in Logicly 1.8. Soon after truth tables introduced, a number of you requested the ability to export them to a CSV file. 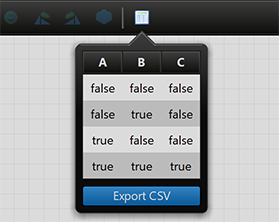 Starting in Logicly 1.9, you’ll find a big Export CSV button right where you need it. When you update to Logicly 1.9, you’ll also receive a number of important bug fixes. BTW: When editing links a good feature would be to highlight the connection point where we are dragging into so that we know that the drop will be accepted and not have to retry (very frustrating). Phillippe, thanks for the feedback! I’m building a new version of Logicly from the ground up that I think will clear up any memory issues. The highlight when a drop can be accepted is a great idea! I’ll keep it in mind for a future update.